A group of high school students sets out to restore an abandoned opera house. 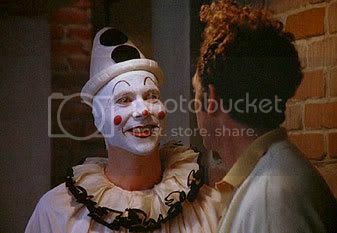 The twist: one of the girls' mother was a budding opera star who was killed in the theatre many years ago, by a deranged clown- and it turns out he's still there. One by one, the cast of characters is slashed off. A killer clown + isolated teenagers + filmed in Winnipeg + amateur camerawork + Margot Kidder during her mental breakdown phase = ETB! From reading up on this film, I learn that the kids get picked off one by one (I assume the heroine lives), Margot Kidder gets an axe in the head, and that Christopher Plummer is either the clown or in cahoots with the clown. Couldn't wait around to see all this go down though, as it was dreadfully boring and looked like a Canadian (poorly) made-for-TV movie of the week. Why Plummer and Kidder were involved is anyone's guess (I'm gonna assume they owed a fellow Canadian a favour). This reeks of some of the crappy like-minded dreck I worked on in Ottawa. And again - clowns! Who cares? (No bonus points for guessing that the clown is dressed as Pagliacci). not much mre to add. This would have been better if by 45 minutes in we saw a) a clown, b) someone getting killed by a clown c) ANYTHING! You know what's scarier than nothing? ANYTHING!